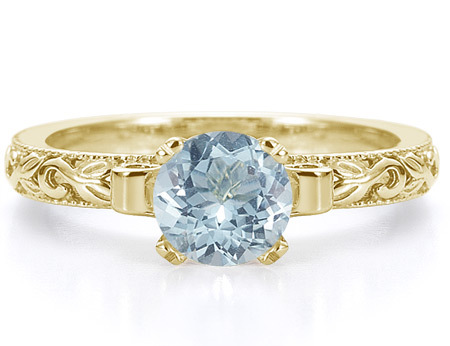 With an icy blue color, authentic aquamarine is a favorite gemstone for a variety of occasions, and will be treasured in this 1 carat aquamarine gemstone and art deco style ring from Apples of Gold Jewelry. The 14K yellow gold ring features a beautiful design that focuses on details, as well as a 6mm round cut aquamarine gemstone. The gemstone is rated A and will add some dazzle to any outfit that it is paired with, for any occasion! We guarantee our 1 Carat Art Deco Light Blue Aquamarine Engagement Ring, 14K Yellow Gold to be high quality, authentic jewelry, as described above.